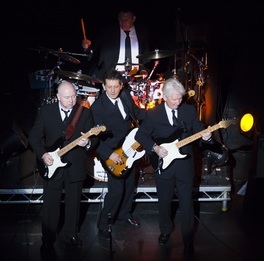 2016 marks a full 54 years of non-stop touring for The Searchers. When the incredible beat boom of the mid-sixties that saw so many bands riding on the crest of a seemingly unstoppable wave of success subsided, many simply disbanded and got on with their lives as best they could. Not The Searchers. They stayed firmly in place, a constant unit riding out the bad times putting the twilight years of the cabaret clubs to good use as they diligently honed their stagecraft. They also upgraded the quality of their shows to please the more mature audiences who had replaced the screaming teenage girls who had mobbed them in those years of chart-topping glory. Such dogged determination was to stand them in good stead for the momentous nostalgia revival which was to lift them once again to national and international prominence. Bassist and front man, Frank Allen, left the hit-making band Cliff Bennett and The Rebel Rousers to replace Tony Jackson in the band in August 1964 and went on to perform hits with the group such as ‘When You Walk In The Room’, ‘Love Potion Number Nine’, 'Have You Ever Loved Somebody', 'When I Get Home', and 'What Have They Done To The Rain', to name but a few. In the summer of 1989 Britain’s first pop knight, Sir Cliff Richard, requested their presence to help him celebrate his thirty years as a star at Wembley Stadium. The audience numbered 80,000 on not just one, but on each of the two dates at the giant football stadium, providing The Searchers with their largest ever audience. While they won’t be expecting anywhere near that number at their 2016 gigs across the country, their audiences will certainly be getting a more intimate two hour gig full of the distinctive jangle of the twelve string guitar, which remains a most important feature of their sound, along with those rich and vibrant harmonies still embellishing the songs that have provided a soundtrack to the lives of so many. The eternal popularity of this legendary group ensures that the demand for concerts is always there but the real reason for maintaining that exhausting work rate is the best reason of all - they truly love what they do. Not being around during the sixties myself, (no, honestly) I thought I would take the opportunity to ask Phoenix FM's Keith Rogers, a hugely respected pirate DJ on Radio Northsea International during that period, to ask lead singer, Frank, some questions about his time and experiences with the band; especially knowing that Keith would frequently spin their much requested singles on his radio show. Here's Keith’s interview with Frank. 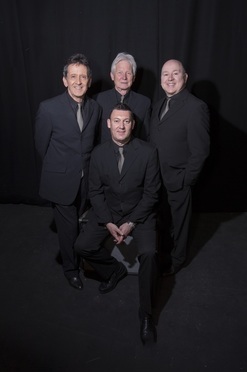 Like the Beatles, The Searchers were also formed in Liverpool. Can you tell me a little bit about what the music scene was like in Liverpool at the beginning of the sixties? It was a hive of small clubs where enthusiastic amateurs played constantly in night time and lunchtime sessions. I don`t believe there was anything like it in any other British city. It even had its own music paper, The Merseybeat, which dealt with the national stars but which also concentrated on its home grown talent. How aware were you of the Beatles in the early sixties, before they became famous, and did you ever perform with them in Liverpool? I didn’t join The Searchers until August 1964, my first disc being 'When You Walk In The Room' but I was aware of The Beatles from my first visit to The Star Club in Hamburg when I was still with Cliff Bennett & The Rebel Rousers. All the bar staff were talking about them so you knew they had to be special. I saw and met them first on my second trip at the end of 1962 when they played their last two nights there. They certainly had something and it wasn’t just in their music. It was in their personalities and their character. They exuded command and character. What countries have you been particularly successful in (apart from the UK, that is)? Germany certainly, but in recent years we have built a huge following in Australia. We spend 6 weeks there every year and absolutely love it. 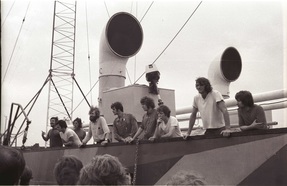 How popular were you in the States in the sixties and do you remember your first tour there? The band was very popular, although far behind The Beatles and a little behind Dave Clark and Herman`s Hermits. I wasn't with the band on the first tour; I made the second in September `64. That began at The Fox Theatre in Brooklyn where we played 7 days of concerts. Six shows every day, with Dusty Springfield, Millie, Marvin Gaye, The Supremes, Martha & The Vandellas, Smokey & The Miracles, The Temptations, The Contours, Little Anthony, The Ronettes, The ShangriLas, The Dovells, Jay & The Americans and The Newbeats……..and we were listed in the programme as headliners! Those shows were followed by a series of dates across the States of varying degrees of quality and audience quantity. I loved it. By 1967 the hits had dried up. Was it difficult to cope with that? To be honest, yes. We had to cut our finances. Hotels became B&B’s, cars became vans and we survived on a much reduced income - BUT it turned out to be a university education for what was to come. The cabaret circuit taught us how to prepare a show for adults and how to deal with an audience that sat and listened, rather than scream and rush the stage. I wouldn't want to repeat it but there were a lot of fun times. You've now been together as The Searchers for more than 50 years. I guess that there must have been times when you wanted to call it a day? I might have felt low at times but I was always desperate to keep it going us long as possible. After all, we were still musicians earning a living doing what we loved. And we hung on in there until the nostalgia boom kicked in round about the end of the seventies. From then onwards it was an incredibly fruitful period both artistically and monetarily. How has your stage act developed over the years? For instance has your repertoire changed very much? These days it is not just songs, it is a history of The Searchers both in music and anecdotes. We connect very closely with our audience and instil an amazing sense of loyalty in them. What in 1963 consisted of 6 songs in front of a screaming crowd, now consists of two hours of hits, album tracks, ‘B’ sides as well as other stuff which is there because we either have a tale to tell……or maybe just because we want to. What sort of audiences do you tend to get? Is it mainly people who remember you from the sixties or does it tend to be a wider age range than that? The widest you can imagine. I always say that our audience these days goes from incredibly young to fast approaching death! Our youngest fan at a concert was last year. His name was Lucas and he was 6 months old! Can you tell me about a couple of particularly memorable stage performances? If you had a night off, which band or singer would you go and see? All my absolute favourites (Elvis, Buddy Holly etc) are dead but I do love The Dixie Chicks. I also love The Great American Songbook performed by Michael Feinstein. What do you think of the current music scene and which artists particularly impress you? I am the wrong person to ask. I’m not qualified to answer. I don’t listen to music either in the car or in the home and little excites me. That is not a condemnation of any new music. It just means that I am not 15 any more. That’s when I was passionate about it.